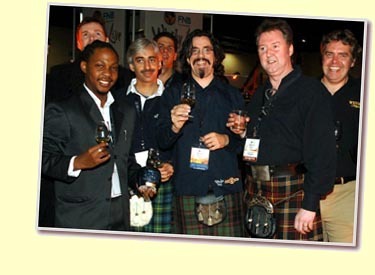 Having flown down from East London to Cape Town I attended on the 1st and 2nd November the FNB sponsored Whisky Live Festival which was held at the International Convention Centre in Cape Town. The first workshop was the “Craft of Blending” presented by Don Paul who is the author of “My Whisky Companion”, which I have recently read and he is also headmaster of the College of Whisky in Cape Town which specializes in training industry personnel in the art of whisky tastings and presentation of whisky products. Don gave us all a brief history of whisky distilling and how blending takes place on a commercial basis and during his talk he made sure a number of malts circulated amongst us so there was no chance of anybody running dry. We then started our own blending attempt with each of us having a 200ml bottle which already contained the base which was about 100ml of Cameron Brig grain whisky. There was a choice of about 28 single malts to add to the base and with only 100ml to add one had to be careful not to overdo the individual blends. Of course as Don pointed out if we were lucky enough to hit the jackpot and create “the perfect blend” we had to remember the exact quantities of how we did it but with 20 or 30 people present we all ended up just pouring it in and not measuring it. One of my neighbours was very unhappy with his creation which he said tasted a bit like “paracetemol” but I was quite happy with my blend which on top of the Cameron Brig base contained Clynelish, Glen Elgin, Dalwhinnie, Glendullan, Highland Park, Macallan and Lagavulin (How’s that for giving out secrets!). I managed to add two new whiskies to my mileage being Cameron Brig and Glendullan and all in all it was a most enjoyable evening with the added bonus of being able to take your creation home where my brother and I finished off the evening by enjoying a few tastings of the blends we had created. The second night at the Festival began with a visit to the main tasting hall. The main hall contained the many exhibitors’ stands, hospitality areas and foodstalls, where we tasted amongst others Highland Park, Glenmorangie, Macallan and Talisker. The locally produced Three Ships whisky was also there, who in 2003 came out with a10 y.o. single malt with only 6000 bottles available, a first for South Africa. A very interesting exhibit was the Wall of Whisky which was a display of whisky’s available from Picardi Rebel, a large South African liquor chainstore and if you purchased one of their products you put yourself in line to win all the whiskeys contained in the Wall of Whisky, a prize worth about R35000.00. Here’s hoping! But the most interesting stall for me by far was that of the Scotch Malt Whisky Society South African branch. Yes, they are here at last, based in Johannesburg and I met Keith and Caroline from the Society and Annabel, a delightful young Scottish lass from the Society’s head office in Edinburgh who was out here to assist with the launch. They had some very interesting whiskies, I tasted an Invergordon 24 year old, a Glendullan 14 and a Glen Scotia 14 all of which were first time tastings for me. The evening culminated in a workshop presented by the inimitable Dave Broom to whom I passed on Johannes’ regards. Dave’s workshop entitled “Free your mind” was a fascinating journey involving some lesser known whiskies and for the second time that evening I had the pleasure of tasting one or two that I had not come across before. Dave’s fascinating talk illustrated a different way of enjoying whiskies, a Slow whisky the Glenrothes 1991 14 year old, a Quick whisky Compass Box Oak Cross, a Subtle whisky a 12 year old Linkwood, a Young whisky a seven year old Ardbeg Still Young, a Weird whisky an Invergordon 40 year old and a Rare whisky a Benriach 25 year old. This is the first time that I had met Dave Broom and I can only admire his passion and dedication to his subject. The evening culminated in an all too quick return to the Scotch Malt Whisky Society stand, the drive home and a final nightcap at home tasting a dram of the previous evenings’ homemade blend.